Having now completed the low FODMAP diet for the full 8 weeks (time does really fly!) the next phase was to reintroduce the foods high in FODMAPs back into our diet. Following the low FODMAP diet had become part of our daily eating routine, and after 4 weeks it quickly became fairly easy to follow with not much thought needed for making appropriate food choices. However, the diet is not designed to be forever! Rather it is designed to reduce the overall load of FODMAPS in the diet to reduce severity of symptoms. Once this is achieved the aim is to then reintroduce FODMAPs to your personal tolerance levels. This became tricky for us, given that we do not have a clinical diagnoses of IBS and were not looking for a significant reduction of symptoms. We did however find a change in gastrointestinal symptoms from following a low FODMAP diet and as such were very interested to identify the exact problem FODMAP foods which increased symptoms when we reintroduced them. First you need to keep the low FODMAP diet rolling along in the background whilst reintroducing the right amount of test FODMAP food. We found it can be difficult to incorporate this into meal planning, especially as you are meant to test a particular FODMAP food three days in a row. One option is to just cook the same low FODMAP meal three days in a row and increase the dose of the test food (if your not getting any symptoms of course). We decided to do it the harder, but more interesting way and incorporate the test foods into meals & snacks and an example of how we tested a high FODMAP food is shown below. Like this Polenta & Mushroom dish I cooked yesterday which I could also have used as a suitable low FODMAP meal with a test food (mushroom) to challenge. Some tests are definitely easier than others. For example when you test fructans (such as wheat, onion, leek) which are found in many foods you will be glad there are some foods containing fructans that can be had as a snack rather than needing to incorporate them into a full meal. Bringing fructans back into the diet by trying 2 slices of bread was easy and enjoyable, and provided the first opportunity to enjoy some delicious fresh bread! There are many different foods which contain fructans, and so you should always test a few different ones (or more if you want), especially if you feel fructans are a particular problem for you. Mashed broad beans & parmesan cheese on toast! The benefits of reintroducing FODMAPs! It is worth noting that the symptoms experienced from the reintroducing of high FODMAP foods may in some cases seem worse than before the low FODMAP diet was started. This may be due to slight changes in your tolerance levels to FODMAPs due to not having these foods in your diet for 4 weeks or more as well as changes to your gut microbiota. Foods high in FODMAPs are also prebiotics, meaning they provide food for the good bacteria in your gut, which is a good thing and is an important part of a balanced healthy diet. By not consuming foods containing these prebiotics you may affect the natural flora in your gut which could lead to more gastrointestinal and other problems in the future. This is a very interesting topic which is being researched as part of the whole FODMAP evidence base. The main aim is to ensure you keep yourself and your gut healthy for the long-term. The world of FODMAPs is changing and information on the low FODMAP diet available on the internet goes out of date fast. The information you can now find on the restriction phase of the low FODMAP diet is more consistent and correct these days however when it comes to the reintroduction phase there is still a lack of information and what is available is not always accurate. Even the article above ‘Reintroducing FODMAPs‘ is now out of date due to the increased knowledge we have on the FODMAP content of foods and how this relates to successfully being able to ‘re-challenge’ yourself with FODMAPs. To avoid the pitfalls of reintroducing FODMAPs using wrong or outdated information this article will give you some important points to look out for. Reintroducing FODMAPs into the diet after completing the restriction phase of low FODMAP diet is the most important element of this dietary approach to treating symptoms of IBS. This is probably why my previous post on Reintroducing FODMAPs has been the most viewed post on the blog, on average, over the last couple of years. It is also the main reason I wrote the first ever book dedicated to the reintroduction phase of the low FODMAP diet. I find too many people restrict foods unnecessarily and need better information on how to challenge foods and test their intolerance(s). Reintroducing FODMAPs can be hard and is a lot more complicated than following a list of foods to eat either high or low in FODMAPs. Plus there is lots of misleading information on the reintroduction phase so if you are relying on the internet for information rather than seeing someone who is trained and/or qualified (preferably a registered dietitian) then it can get even more confusing. Let me use an example to show this. Through searching the internet (using Google) the most common information provided on reintroducing FODMAPs is from blogs or websites. The majority have loosely based their information on the paper below by Monash University from 2012. The problem with this is it is incorrect. The people who have created this table do not fully understand the reintroduction process and they have made some mistakes in translating the research. In fact the portion sizes they suggest you start with are going to be way too high in FODMAPs in the first place. It will be likely a lot of people will get symptoms straight away if they eat this portion size. This may have negative consequences as people may think ‘oh well, I have tested all these FODMAPs and I can’t eat any of them I had better stick to a low FODMAP diet for ever!’. A better and more accurate approach is to start with a smaller portion size of FODMAP and gradually increase the portion over three consecutive or non-consecutive days. That way you know the amount of FODMAP you can tolerate and when the portion size is too large and starts to trigger symptoms. Testing tolerance levels foods that contain more than one type of FODMAP is more likely to cause symptoms than help test tolerance levels! Another mistake made is the foods chosen above actually contain more than one type of FODMAP. For example mushrooms contain significant levels of both fructans and mannitol so when testing symptom reactions it would be difficult to know if it’s the fructans or the mannitol triggering your symptoms. The Monash University low FODMAP app states 4 apricots are high in both sorbitol and fructans meaning you are once again confusing two FODMAPs and also starting at a portion size far too high to start with. This is more likely to cause symptoms than help test tolerance levels. The tables also suggest using 200g yoghurt. Most yoghurts are 150g anyway therefore you are consuming a very large portion size of yoghurt and therefore lactose – meaning you are likely to experience symptoms. One whole clove of garlic is not a good starting portion size to test tolerance levels either. Even ½ a clove of garlic contains high amounts of fructans and may trigger symptoms. It is better to start with a smaller amount of garlic and gradually increase the portion size for the test to have some degree of accuracy. Much of the information available via the internet on reintroducing FODMAPs is out of date although you wouldn’t be aware of this without having extensive knowledge on the subject. When it comes to reintroduction you really should seek information from someone who knows what they are talking about. Ideally you should go and see a dietitian. The problem is not everyone with IBS has access to a dietitian or cannot afford to see a private dietitian, while others would rather do it themselves. In fact if everyone in the world with IBS actually wanted to see a dietitian then there would probably need to be a dietetic clinic on every other street corner. For those who do not have access to a dietitian but still want accurate dietetic information I have written the first ever book dedicated to the reintroduction phase of the low FODMAP diet. Testing FODMAPs: How does the reintroduction phase work? Re-introduction of FODMAPs: is there an easier way? Are You Ready To Reintroduce High FODMAP Foods? We recently travelled around the world and blogged about following a modified low FODMAP diet. See more on our FODMAP travel section. Interesting post. I’d like to know more about prebiotics, as I only eat the basic low fodmap diet. All the reintroduced food groups gave me problems. What this interesting piece of research shows is that the low FODMAP diet can reduce the amount of bifidobacteria in the gut perhaps due to the lack of prebiotics feeding these bacteria. Bifidobacteria has been shown to have an important role in immune function and digestive symptoms in IBS therefore the theory is by continually having a low FODMAP diet and therefore having a lower amount of bifidobacteria you may be increasing your risk of further digestive problems or other future health issues. This is a general assumption and the reality, as with all research, is that each individual will be different. Also remember this piece of research was only for a few weeks and the long term effects have yet to be determined as have any detrimental effects long term from following the low FODMAP diet e.g. although in the 4 weeks in the study the amount of bifidobacteria decreased did this continue long term? did the bifidobacteria rebalance itself even if a low FODMAP diet was continued? did the levels of bifidobacteria increase when the re-introduction phase and normal diet were completed? More research is obviously needed and until we have all the answers the initial aim of the FODMAP approach should be remembered which is: to follow a low FODMAP diet to reduce severity of symptoms and then re-introduce to personal tolerance and consume as varied a diet as possible. If you haven’t achieved this goal it might be worth you going to see a dietitian to see what individualised advice they can give around what options are available to you. I’ve also been eating raw unpasteurized sauerkraut which I’ve heard is a FODMAPS friendly way to boost good gut bacteria? I haven’t seen any data for unpasteurized sauerkraut so that may be purely speculation. What about taking a prebiotic supplement? Would it be considered a high FODMAPS supplement? The chances are a prebiotic supplement will be high in FODMAPs but this doesn’t necessarily mean it will increase symptoms. Some prebiotics, for example, Bimuno have been shown to help improve IBS symptoms when taken at the correct dose. At the moment there is not enough evidence to recommend a specific type of prebiotic so its trial and error for anyone who wants to try. It is definitely an interesting research theme for the future……. I am a RD as well and have IBS. The low FODMAP diet has alleviated my symptoms and I feel wonderful. The re intro phase is confusing to me since there are a few conflicting manners to re-intro the food groups. I agree that testing 1 food at a time seems the most sensible vs several different food from the same group in 1 day. However, it seems like this would take so long to get through each group. I am still contemplating what approach to use with my future clients. Sorry I missed this comment it went into my spam! At the moment there is no universally agreed approach to reintroducing FODMAPs. My book discusses the two options most widely used and practised by the majority of dietitians in Europe and Australia. 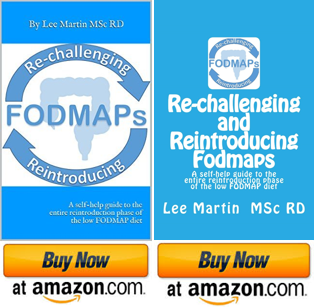 Usually the re-challenging part takes 10 weeks and this will help people to understand what individual FODMAPs and what portion size of these FODMAPs they can tolerate. This allows relaxation of the low FODMAP restriction diet and reintroducing FODMAPs back into the diet. To completely reintroduce FODMAPs and understand how the combination of FODMAPs triggers your symptoms is an ongoing process.